This post will try to focus on some of the very useful and coolest tips and tricks of HTC One including some hidden features as well. So no further ado and let’s enjoy the awesome features of this smartphone. In HTC One, Phone app can sometimes be very confusing because of those five different tabs: Call History, Phone, Favorites, People and finally Groups. If you don’t want to see these tabs, or just want to have the ones you regularly use, there is a hidden feature to do that. Go to Settings > Edit Tabs, and simply uncheck all those tabs that you don’t use and want to be hidden. Capturing screenshots is pretty easy on HTC One and actually, there are two different ways to do that. Perform these two following combinations to capture screenshots which will then be stored in your Phone Memory. During the copy/paste task on HTC One, though the task is pretty easy since you just have to long press to get to those options, the problem is of reading the text that you want to select and tapping it correctly. For those times, use the Magnifier: tap on the Settings > Accessibility > Show Magnifier > Yes > and then tap the anchor to enlarge text in magnifier. 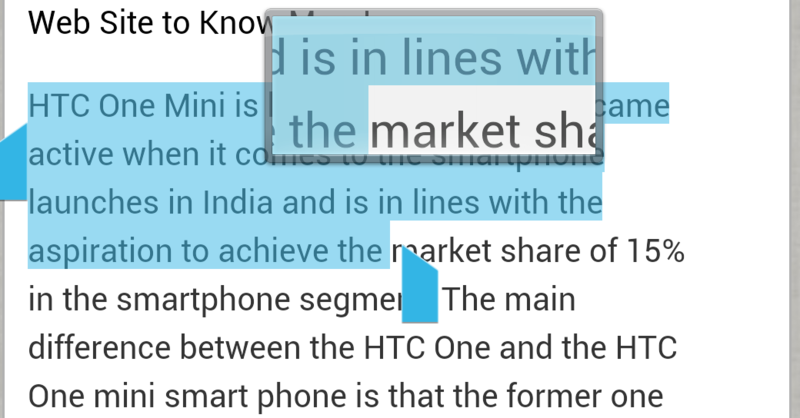 This will help you to easily read and select text in HTC One. To access the applications running in the background or just to switch between the applications, there is a simple shortcut combination. Double tap on the Home button and it would show you a new window with some 9 applications which were accessed recently. Remember this shortcut for next time when you have to multitask in HTC One. You might be reading something or just surfing on the internet and want to scroll to the top of the page. Instead of scrolling, just tap once on top of your notifications bar and it would take you to the top of the page. Saves hell of a time and effort. With an incredible camera that HTC One has got, perfect focus is just a tap away too! Whenever you need to focus on some object and want everything else to go blur, tap on the screen to select the object you want to focus on and everything else in the background would get blurred. This is a DSLR level feature but available in HTC One so take some advantage to show off your photography skills! Although focusing is important, but tapping on the screen has an alternative function as well. In case you prefer to take photos with one tap on the screen, you can enable that through the Settings in the Camera app. Go to Settings > Shutter option > Touch to Capture > check ON. You don’t have to go through many settings or options to switch camera to front one from the back camera. Simply swipe your fingers on the screen to quickly switch the camera. Tada! Easy and useful. 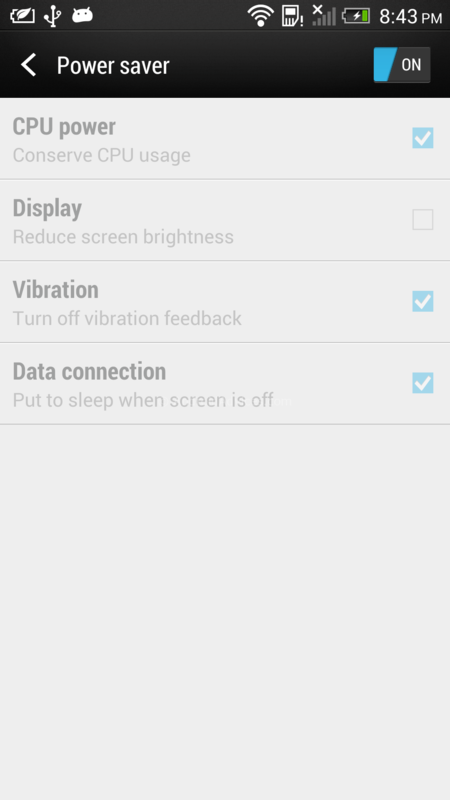 You can change the notification settings on your HTC One. Go to Settings > Display, gestures & buttons > Notification Flash. Select any of the services for which you intend to Enable or Disable the notification flash service. When you scroll with two fingers in the contacts, it makes the list ordered and easier for you to search the right contact faster. It is especially preferable if you have hundreds of contacts and you would wish to search content in the alphabetical order. There are times when you want to hide some apps: you may have downloaded many applications which are not useful often and you want to hide them. Tap on Settings in the applications page and you would get the option to Hide Apps. Tap on it and select the apps that you want to hide. Often times we want to hide some messages from everyone. They can be private texts or our pin codes. Usually you will be required to download some app from Play Store to hide selected SMS texts but HTC One has made it easier. You will be required to setup a password before using this feature. Tap on Messages > General > Settings > Password > and enter Password. Once the password is set, return back to the main messages application screen and long press on the message that you want to hide. You would get the option to Move to Secure Box. To read these hidden texts, tap on the top left corner of this screen, and go this path: on the drop down option which comes up when you tap, tap on Messages > Secure, enter the password and done! Enabling the power saving option on your HTC One will lower your CPU frequency, decrease the screen brightness, turn off the vibration feedback and also disable the Data connection when screen is off. In the end, saving up a load of battery juice. So these were some of the top HTC One tips, tricks and hidden features that we thought could be useful for HTC One users. Let us know if you want any more of your favorite ones to be added.